Larisa Kurashyna is a communications manager with Pact's RESPOND project in Ukraine. In the inner suburbs of Dnipro, in eastern Ukraine, a slender woman with shoulder-length blonde hair waits in the yard of a shabby house surrounded by June greenery. She smiles with her big blue eyes, welcoming a visitor. There are neatly planted tomatoes and strawberries, а doghouse with a Rottweiler inside, blooming chamomiles and a children’s rope swing between two cherry trees. In her late 30s, Olha is a self-employed beginner potter. She dreamed up the idea of opening a pottery studio last year when she attended Studio of Opportunities, a livelihoods program for women affected by HIV. In Dnipro, the program was piloted by the local branch of the All-Ukrainian Charitable Organization “Network of People Living with HIV” with a grant from the USAID RESPOND project, which is implemented by Pact. In the yard stands a small wooden building that resembles a shed or a greenhouse. Inside, there is just enough room for a table, a cupboard, a couple of chairs and a potter’s wheel. Donations raised by the Network helped Olha buy an electric wheel as well as a kiln to bake her pottery. Since 2013, Pact has been providing technical assistance to the Network, building its organizational capacity. Pact has helped to improve the Network’s fundraising strategies, including with a pilot social entrepreneurship initiative to diversify its funding streams. Olha describes the hardships she faced after her mother died when she was younger. Immediately, a second-year law student became a girl with no parents, no money and no home. 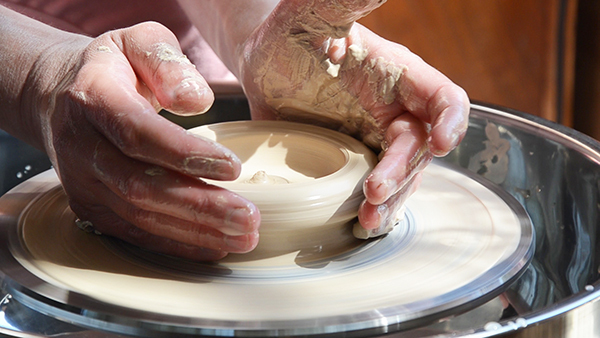 She takes a lump of terracotta clay, shapes it into a wet sphere and drops it onto the wheel. As the wheel rotates, it makes a comforting sound. Olha explains that in addition to providing pottery lessons and equipment, Studio of Opportunities taught her that only she could decide what she wanted to be in life. After more than four years without a job – people with HIV often face employment discrimination in Ukraine – Olha grew tired of chores and daily pills for the virus. She even asked her social worker if she could stop treatment for a while. “The social worker advised me to enroll in Patient School, which I did. Having completed the Patient School, I continued my ‘schooling’ in Studio of Opportunities,” Olha says. Patient School works to improve adherence to antiretroviral therapy (ART). Current treatment for HIV is not a cure, but it can keep the virus under control. With good health care and treatment, many people with HIV are living as long as people without the disease. They can continue to have relationships, to work or study, to make plans and to have families. Patient School is integrated with economic strengthening programs like Studio of Opportunities, and its services include women’s financial needs assessments, case management, financial literacy training, mapping of community resources, vocational counseling and training, and other components to improve people’s health and livelihood. Soon Olha’s husband arrives, peeking into the pottery studio grinning. “Do you need any help? I will bring some more pieces,” he says, turning to go. Olha continues her story, frequently dipping her hands into a bowl of water to give the clay more height and to thin the walls of the new vessel. Vladimir brings in ceramic dishes, mugs and pots and carefully arranges them with the newly made vessel on the table, like chess pieces on a board. Then Olha explains her newest endeavor. With the Network, she is starting a pottery studio for children whose parents cannot afford to pay for pottery classes. It will be a social enterprise. She presented the idea in May at a Community of Practice meeting organized by Pact to foster social entrepreneurship.